Fiber is one of weight loss's little secrets. The main structural component of plants, fiber can't be digested by the human body. Its primary purpose is to add bulk to the contents of your stomach and digestive tract, which helps move things along and keeps you regular. As a bonus, the extra bulk in your belly helps fill you up and keep you feeling full so you can limit your calorie intake. Having a fiber-rich shake as a snack or meal replacement each day just might be what you need to shed those extra pounds. Fiber-rich foods, such as fruits, vegetables and whole grains, tend to be healthy and low in energy density, or calories per gram. Eating a lot of low-energy-dense foods helps fill you up on fewer calories so you can control your calorie intake to lose weight. According to a review published in "Nutrition" in March 2005, dietary fiber intake is inversely associated with body weight; people who eat more fiber tend to weigh less and have less body fat. Replacing one meal a day with a nutritious, high-fiber shake can help you create the calorie deficit required for weight loss. To lose 1 to 2 pounds per week, which is considered a safe and healthy rate of weight loss, you need to trim 500 to 1,000 calories from your daily diet. If you normally go out for lunch with coworkers and take in 800 calories or more, skipping the lunch outing and whipping up a fiber-rich shake in the kitchen at your office can save you 500 calories. That one change is enough to lose 4 pounds in a month. Healthy fiber-rich meal-replacement shakes should contain a mix of complex carbohydrates, lean protein and healthy fats and no less than 200 calories. This ensures you get all the nutrients of a whole meal. 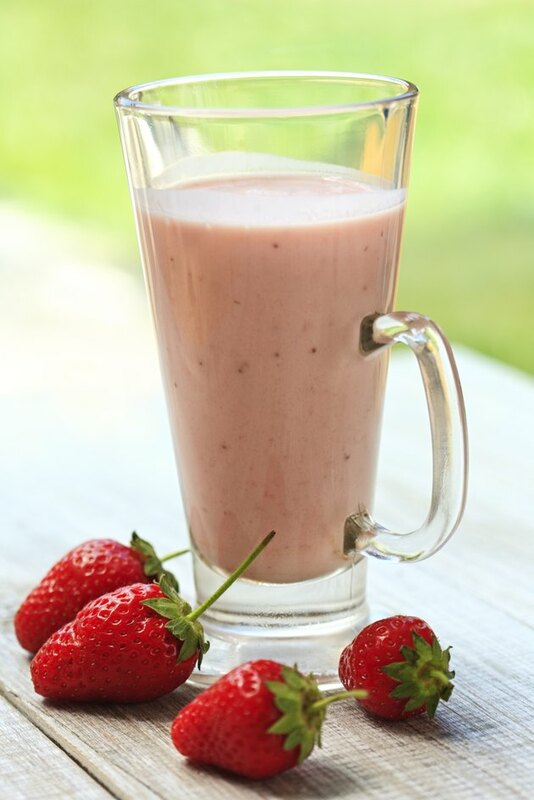 Choose a low-calorie liquid base for your shake such as skim milk, almond or rice milk or low-fat coconut milk. Add in your fiber sources -- berries are one of the highest-fiber fruits with 8 grams per cup. Leafy greens are another good source of fiber and abundant in vitamins and minerals. Throw in a handful of a mild green such as spinach. Nuts and seeds are other fiber-rich additions that also provide healthy fats and protein. Choose from walnuts, almonds and chia, flax and sesame seeds. Get creative with flavors by adding cinnamon, pure cocoa powder or fresh mint leaves. It's best to make your shake yourself with healthy ingredients of your choosing. Store-bought shakes often contain large doses of sugar and other unhealthy ingredients. Be sure not to sabotage yourself either; it's easy to get carried away and throw everything but the kitchen sink in your shake, but you could be creating a calorie bomb. Fresh fruit will give you all the sweetness you need without adding sugar, but if you really need a sweeter shake, add a drop of stevia, an all-natural sweetener. Super Skinny Me: How to Make a Smoothie - Awesome! Is Fiber One a Healthy Cereal?